This Error Message Article explains the BACKTRACK error message “You must program your PDT on this copy of the application in order to retrieve information” and details how to fix the underlying problem that caused it to appear. BACKTRACK checks to make sure the data received from a PDT (i.e. upload) comes from a PDT program that was downloaded by the same BACKTRACK and that the programs are consistent. It is unclear exactly what BACKTRACK checks, but likely there is some version and/or date stamp on the PDT program that is verified. There are times, however, that BACKTRACK gets ‘confused’ and refuses to accept an upload of data with that error message. This has happened even when we are sure the application is the same. In our experience, the one solution that consistently work for us is to ensure that the connectivity between PDT and BACKTRACK is properly setup. This includes a correctly configured Windows Mobile Device Center (WMDC). Please refer to <….need a correct title for the article……………..> article on how to setup PDT to work with BACKTRACK. 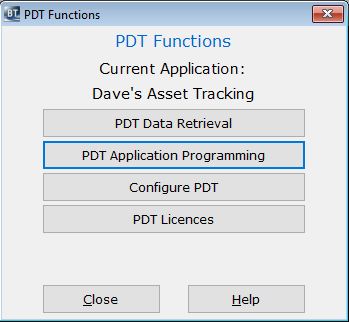 The PDT must be reprogrammed by BACKTRACK. Unfortunately, this will require all the data collected in the previous PDT application on the PDT to be lost. There is no workaround we are aware of to recover this data. A habit that can help reduce the possibility of this problem is to consistently reprogram the PDT after every upload of data. If significant time has passed since the last upload and/or multiple PDTs are being used, it is a good idea to reprogram again before doing a lot of data collection. Need to insert a correct link here.